Eraldo Antonini was a brilliant scientist and a charming captivating man, who died prematurely at age 53, while at the peak of his scientific and academic career. His official biography was published in 1988, in the "Dizionario Enciclopedico degli Italiani", vol XXXIV. He started as a pupil of Professor Alessandro Rossi Fanelli, the founder of the "Biochemistry Rome School", and at age 30 he was already a world famous scientist. Some of his contributions of that early period were seminal and very original. In 1958 he was co-author in a paper reporting a simple and reproducible method to prepare native human apohemoglobin that could be reconstituted by addition of protoheme. This experiment not only paved the way to a wealth of studies conducted in Rome and elsewhere to understand the role of the porphyrin structure and the nature of the metal in controlling hemoglobin's function, but had a deep conceptual value in so far as it proved that the globin is endowed with all the information necessary to achieve a functionally competent, mature and cooperative hemoglobin. That paper, published in Biochimica et Biophysica Acta (vol. 30, 608, 1958), became a Citation Classic, and a commentary signed by A. Rossi Fanelli was published in the Current Contents, Life Sciences by the ISI. In 1961 he published in The Journal of Biological Chemistry an astonishing observation for the time, showing that removal of the C-terminal amino acid residues of either the α or the β chains of human hemoglobin raised the oxygen affinity, lowered cooperativity and reduced dramatically the Bohr effect. This observation was inspiring to Max Perutz, who wrote: "Several years later, my electron density maps showed that these residues form salt bridges with neighbouring subunits in deoxyhaemoglobin which get broken on transition to oxyhaemoglobin. Remembering Antonini's observation, I realized at once that these bridges must represent the additional bonds between the subunits in the T structure predicted by Monod, Wyman and Changeux's theory of allostery. Antonini had also demonstrated that the release of Bohr protons is colinear with oxygen uptake. When Kilmartin's and my work proved that most of the Bohr protons originate from the salt bridges, it became clear to me that oxygen uptake is linked to the rupture of these bridges." (from M.F. Perutz, Recollections of E. Antonini, published in the Proceeding of the Brussels Hemoglobin Symposium, July 1983) . 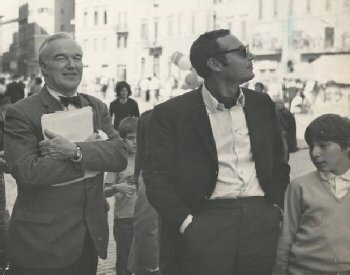 Eraldo's captivating personality and original science attracted to Rome Jeffries Wyman, who in 1961 (at age 60) came for one week's visit and remained working in the "Rome group" for 25 years. The intellectual consortium between the two lasted happily for a long time and produced a remarkable series of outstanding papers and conceptual advancements that had a long-lasting influence on protein chemistry at large. In 1964, two seminal Review articles on hemoglobin were published, side by side, in the Advances in Protein Chemistry, vol.64, one by Rossi Fanelli, Antonini and Caputo on the experimental aspects, and the other by Wyman on the theoretical aspects. Antonini's encyclopaedic knowledge on the structure and function of hemoglobin and myoglobin led to the publication of a monograph written with Maurizio Brunori and published in 1971 by North Holland (Amsterdam). This volume, which is still a valuable source of information on hemoglobin, was itself a Citation Classic, as reported in the Current Contents, Life Sciences in 1991. In 1981 Eraldo was Editor jointly with Luigi Rossi-Bernardi and Emilia Chiancone of a volume of the Methods in Enzymology, the first fully devoted to Hemoglobins. 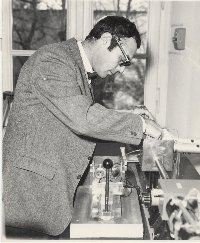 In the seventies, Antonini expanded considerably his scientific interests, focussing particularly on electron-transfer metalloproteins (such as cytochrome-c-oxidase) and on proteolytic enzymes, applying at its best the potentialities of the stopped-flow method that he had learned from Quentin H. Gibson many years before. His remarkable insight and his ever-questing spirit led to some exceptionally original results, such as the discovery of "pulsed" cytochrome-c-oxidase that set the whole field of control of respiration on a new horizon, and still is inspiring experiments aimed at understanding the mechanism of this redox linked proton pump. In the list of the first thousand scientist of the world published in 1981 by the Institute for Scientific Information of Philadelphia, only four Italian researchers were included, and one of these was Eraldo Antonini. 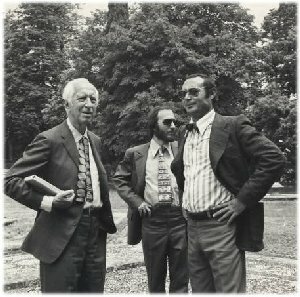 A more complete account of Antonini's career and scientific achievements may be found in the Obituary written by Brunori, Chiancone and Wyman and published in TiBS, vol. 9, p.12 in 1984; a shorter one may be found at this link. Eraldo's personal qualities are more difficult to make justice of. He was brilliant, friendly and captivating to many, as witnessed by the large number of friends and colleagues that streamed through Rome over the years for discussions, scientific challenge and warm hospitality; impossible to even attempt a list. In the larger perspective, the supportive role of his wonderful wife Chicca and his four children Paola, Giovanni, Andrea and Cristina should be properly emphasized. We wish to present to them this recollection of Eraldo, in this special day. Since 1983, the Italian Society of Biochemistry and Molecular Biology (SIB) has entitled the main Plenary Lecture of its annual congresses to Eraldo Antonini. The full list of the scientists invited to give an Antonini Lecture may be found at this link; it includes several Nobel Prize winners. Most of the scientists invited were bound to Eraldo by long friendship and in some cases by extensive collaborations. In 2013, on the thirtieth anniversary of Eraldo's death, the Department of Biochemical Sciences "A. Rossi Fanelli" organized a memorial day and invited Prof. Christopher Dobson (Cambridge, UK) to give a Plenary Lecture. Prof. Israel Pecht, a lifelong friend of Eraldo chaired the session.